If I was by myself I would definitely ride up this hill. It’s a good one. (at 70th and the Burke Gilman trail). However, with 100 pounds of cargo, I reconsidered and went the long way home down the Burke Gilman. 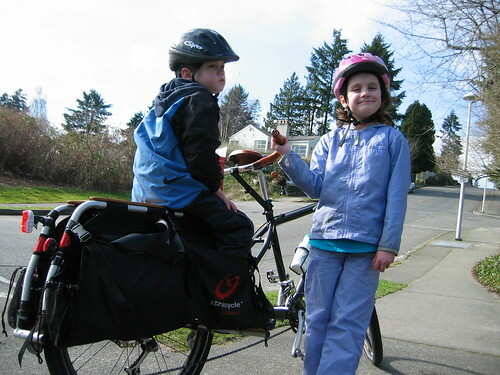 This entry was posted in alternative transportation, BIG Loads, bikes, Burke-Gilman Trail, extravehicular activities, kids, longbikes, seattle, xtracycle and tagged BIG Loads, bikes, hills, kids, seattle, xtracycle. Bookmark the permalink. I know you are committed to your Xtracycle but I have an ‘articulated ridable trailer bike’ (for want of a better name – or maybe they’re called shadow riders) that my daughter absolutely loves to ride. It is fairly low geared so most of the time she just sits there but when we come to a hill I tell her, “PEDDLE NOW! PUSH HARD!” And soon after I feel the bike begin to lurch forward as she peddles hard as she can. The extra burst power generated by my 3.5 year old’s tiny legs is enough to get us up small hills. Just out of curiosity, have you ever tried it with a load? Maybe you can’t do it, or maybe you can’t just yet. It looks pretty steep, for sure, but look at all you’ve accomplished that you might have never thought possible. Plus, your cargo can get off and walk if you stall out. David – That’s great. It’s great what kids will do when you give them some motivation. We looked into trailer bikes before we got the Xtracycles. The problem we had with them is you can only carry one kid – a lot of the time I need to be able to carry two. Also – I love that the “kid carrier” is just part of the Xtra. So when I’m not hauling kids, I don’t have to ride around with a cumbersome attachment on the back of my bike. Bottom line is what ever works for you, go for it. The great thing about cycling is there is something for everyone. Smudgemo – Thanks for the motivation – now I’m going to have to try it! The thing about that hill is there are actually 3 pitches – then a downhill – then another uphill so I guess it’s just a little daunting for me. I do it all the time on my road bike – I guess I just have a mental block when I’m riding the Xtra and hauling kids. I do kick my cargo off on occasion and challenge them to race me. They always win! Yeh… If it was a choice between the xtracycle and that thingie I’ve got there’s no comparison. Good luck with that hill. I’m coming to Anne’s defense here. 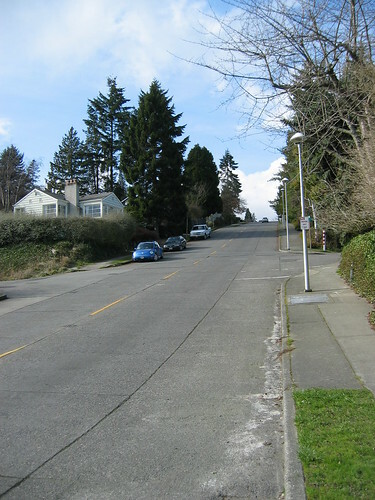 ..I rode that hill on my Xtracycle today after the Seattle Bike Swap. It’s a freakin’ huge hill. I was in my lowest low (24×32) and wishing I could go lower. Even 20lbs on the bike would have meant standing – not something that works real well on a 3/4 mile hill with two kids on the snap deck. Believe me, Anne is pretty tough. I’ll often look for the easy way but not her. If it’s rideable, she’ll give it a go! Certainly I would prefer to have an Xtracycle. Luckily where I live is very, very flat country. I suppose it’s all a matter of gearing… It would have to put a lot of strain on the bike. I first started dreaming of electric assist when I lived in Salt Lake City. It’s on the edge of a mountain range, ya know? I took the plunge after I moved to SC. The downside is, my bike weighs probably 60 pounds. But I don’t walk up hills any more.